It’s natural, here at the lip of a new year, to wonder what 2019 might hold. And it’s bracing to note that Blade Runner (released in 1982) is one of 14 films set in a future that is this, the year on which we’re embarking. But lest we dwell on the dark prognostication they tend to portray, we might take heart from Jill Lepore’s wonderfully-entertaining review of predictions: “What 2018 looked like fifty years ago” and recent honoree Isaac Asimov’s 1983 response to the Toronto Star‘s request for a look at the world of 2019. As we contend with the contemporary, we might spend a memorial moment honoring two extraordinary explorers who died on this date. 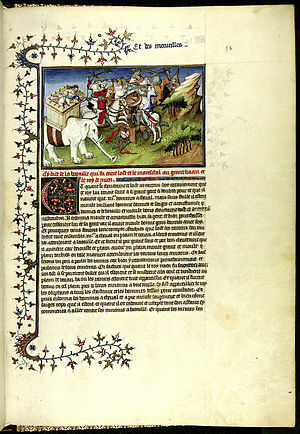 Marco Polo, whose coda to his remarkable travelogue was “I did not tell half of what I saw,” passed away on this date in 1324. 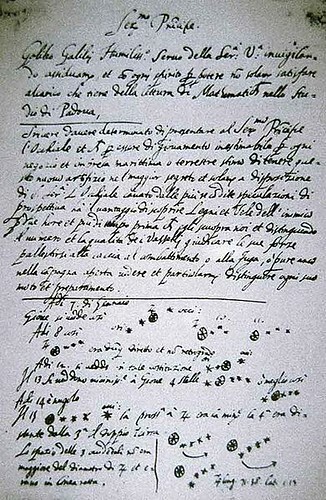 Draft of Galileo’s letter to Leonardo Donato, Doge of Venice, in which he first recorded the movement of the moons of Jupiter– an observation that upset the notion that all celestial bodies must revolve around the Earth. … It might be that people have been studying inequality in all the wrong places. A few years ago, two scholars of comparative politics, Alfred Stepan, at Columbia, and the late Juan J. Linz—numbers men—tried to figure out why the United States has for so long had much greater income inequality than any other developed democracy. Because this disparity has been more or less constant, the question doesn’t lend itself very well to historical analysis. Nor is it easily subject to the distortions of nostalgia. But it does lend itself very well to comparative analysis. Stepan and Linz identified twenty-three long-standing democracies with advanced economies. Then they counted the number of veto players in each of those twenty-three governments. (A veto player is a person or body that can block a policy decision. Stepan and Linz explain, “For example, in the United States, the Senate and the House of Representatives are veto players because without their consent, no bill can become a law.”) More than half of the twenty-three countries Stepan and Linz studied have only one veto player; most of these countries have unicameral parliaments. A few countries have two veto players; Switzerland and Australia have three. Only the United States has four. Then they made a chart, comparing Gini indices with veto-player numbers: the more veto players in a government, the greater the nation’s economic inequality. This is only a correlation, of course, and cross-country economic comparisons are fraught, but it’s interesting. Then they observed something more. Their twenty-three democracies included eight federal governments with both upper and lower legislative bodies. Using the number of seats and the size of the population to calculate malapportionment, they assigned a “Gini Index of Inequality of Representation” to those eight upper houses, and found that the United States had the highest score: it has the most malapportioned and the least representative upper house. These scores, too, correlated with the countries’ Gini scores for income inequality: the less representative the upper body of a national legislature, the greater the gap between the rich and the poor. As we search for the balance, we might recall that it was on this date in 1931 that the National Hunger March gathered in Washington DC to demand jobs and relief. Massing in front of Congress, the 1,670 marchers were met by an estimated 1500 police, and 1000 Marines, all armed. They left without a hearing from President Hoover or any other official, but did have an impact: they set the stage for the 1932 march of the Bonus Army where 43,000 marchers – many veterans – descended on Washington DC to demand payment for the “service certificates” which had given to them in 1924 in lieu of cash.